Renault India has just released a brand new TVC that urges buyers ‘not to settle for smaller’ SUVs. The highlight of this TVC is the starting price of the 2019 Renault Duster, which at Rs. 7.99 lakhs, makes it slightly higher priced than many sub-4 meter compact SUVs such as the Maruti Brezza and Ford EcoSport. In EMI terms, a price difference of under Rs. 1 lakh translates to an EMI difference of less than Rs. 2,000. It’s this messaging that the TVC tries to drive home by projecting the 2019 Duster’s starting price of Rs. 7.99 lakhs. Renault introduced the 2019 Duster in the Indian market recently, and the SUV features a bunch of updates. ABS+EBD is now standard across all Duster variants. The touchscreen infotainment system on the higher variants gets an upgrade with both Android Auto and Apple CarPlay connectivity options now added. The 2019 Duster’s engines and gearboxes remain unchanged for now. However, the variants have been given a rejig. Renault has dumped the RxL trim on the diesel engined Duster, and the Standard trim has also been dumped. 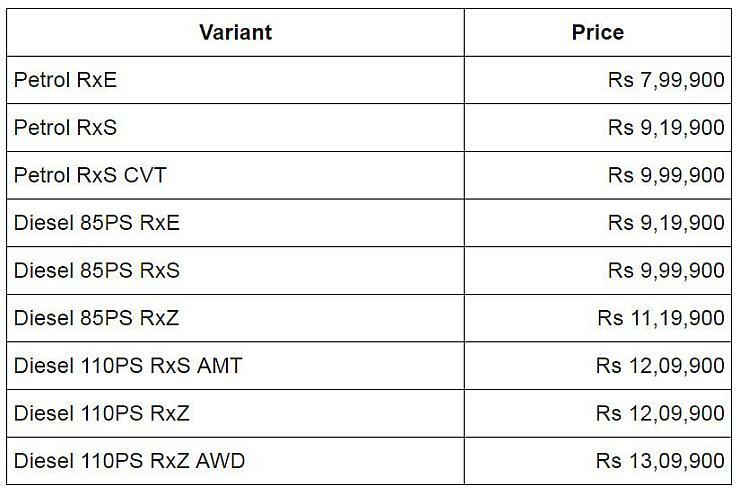 The RxS variant has been added to the AMT equipped diesel variant, which brings down the entry price of the Duster Diesel Automatic, and makes it cheaper than the Hyundai Creta. The petrol engined Duster is now available only in 3 variants – RxE, RxS and RxS Automatic. The Renault Duster is offered with two engine and 3 transmission options. The petrol engine is a 1.6 liter unit with 104 Bhp-140 Nm on tap, and is sold with 5 speed manual and CVT automatic gearbox options. The diesel engine is a 1.5 liter K9K turbocharged unit available in two states of tune – 85 Bhp-200 Nm and 108 Bhp-240 Nm. The lower powered diesel engine uses the 5 speed manual gearbox while the higher powered diesel engine gets 6 speed manual and AMT options. The Duster is the only compact SUV in its segment to be offered with an all wheel drive layout. The all wheel drive layout equipped Duster also gets independent rear suspension and additional safety features such as traction control, hill hold and electronic stability program. It also has lower gearing for better off road performance. Duster AWD is available only in the top-end RxZ trim, and is positioned as a range topping variant with a price tag of Rs 13.09 lakhs, ex-showroom Delhi. By the end of this year or early next year, Renault will launch an all-new Duster. The second generation model will continue to use the B-Zero platform and will also be a 5 seat model, but will be larger than the current version. The all-new Duster will get Bharat Stage 6 emission norms compliant engines. It remains to be seen if Renault debuts all new petrol and diesel engines or modifies the current engines to meet Bharat Stage 6 emission norms. For now though, the latter approach is likely as the 1.5 liter K9K turbo diesel has already been made compliant with Euro 6 emission norms. Also, India is not a market big enough for Renault for a brand new diesel engine.